These are just some of the lovely things our clients say about us – we’re a great team and we’re dedicated to creating your perfect kitchen. 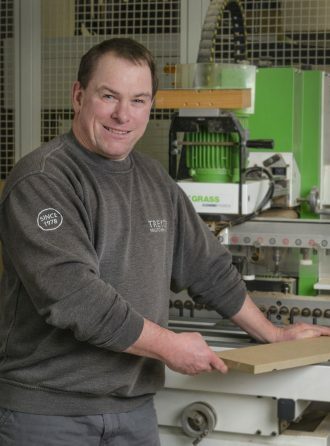 Treyone was born in 1978 when Mike Gething, a joiner by trade, moved to Cornwall and set up a small workshop in a barn next to his house. 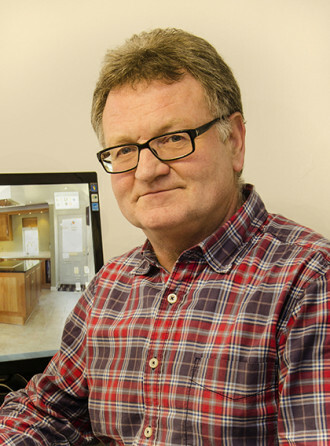 Mike’s first orders included doors, windows and a pine kitchen…Since those early days the company has grown and evolved to become the successful kitchen makers of today; and it’s still very much a family business – we now have three father/son combinations working for us! Find out more about the people behind the faces at Treyone below. Robin’s career with Treyone started in 1980 when Mike, his brother-in-law and Treyone’s founder, sold him the idea of abandoning his IT career in Ireland for the good life in Cornwall. Robin and Mike built the company from a two-man concern working from a barn at Higher Treyone Farm to the thriving kitchen makers of today. Robin oversees all aspects of the business with a particular focus on client care and ensuring a happy work environment. Zoe was two years old when her father Mike established Treyone so you could say she’s grown up with the company. She joined Treyone straight from school as a general trainee, working in, and getting to know, all areas of the business before focusing on kitchen design. She combines encyclopaedic product knowledge with an approach that melds the practical with the aesthetic, and is passionate about cooking and entertaining. Marc is Robin’s eldest son and like Zoe, grew up with Treyone. Marc joined the business in 2004 after completing a History degree and working as a graduate trainee with a large multi-national. Renowned for his organisational skills, Marc takes on many roles at Treyone but is primarily tasked with overseeing the workshop and installations along with managing customer service. 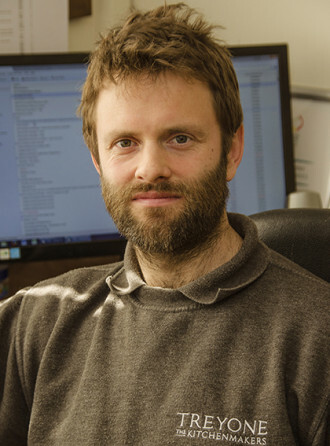 Stewart has been based at Treyone’s Kingsbridge showroom since he joined the company as a designer in 2012. 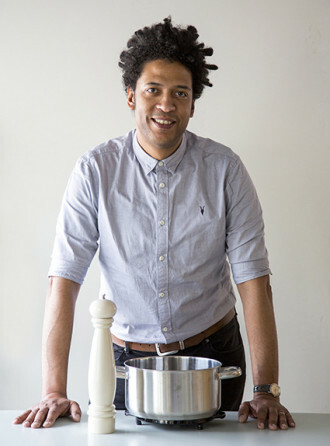 His background includes project management for a major London bespoke kitchen chain and running his own kitchen and fine furnishing consultancy in the capital. He also has valuable specialist experience in granite and quartz products gained from his time managing one of the UK’s leading natural stone fabricators. Stewart is particularly pro-active in keeping Treyone at the forefront of the latest design trends and extending the product range we’re able to make available to our clients. Since joining Treyone in spring 2016, Lloyd has worked alongside fellow designer Stewart, at the Kingsbridge showroom. 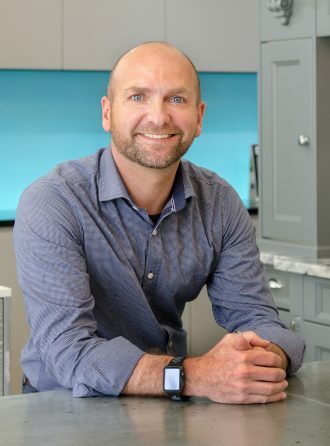 With close to 30 years’ experience in kitchen design, including a spell as an installer, Lloyd holds a Professional Interior Design Diploma and has had one of his designs featured in “25 Beautiful Homes” magazine. 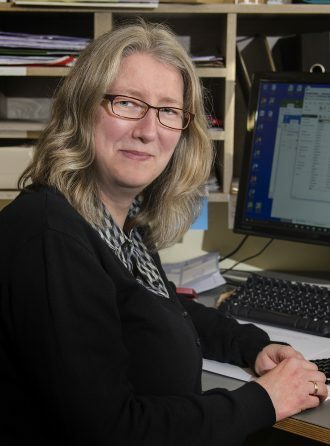 Based in the Truro showroom, Sarah’s adventurous spirit saw her join Treyone following a spell working in kitchen design and architectural CAD drawing on the Shetland Islands. Her career experience also includes a Senior Designer role with an award-winning, UK-wide interior design and architectural practice specialising in the hospitality and leisure industry. She has a first-class BA Hons degree in Interior Design and enjoys travel - a recent highlight being an inspirational round-the-world trip. 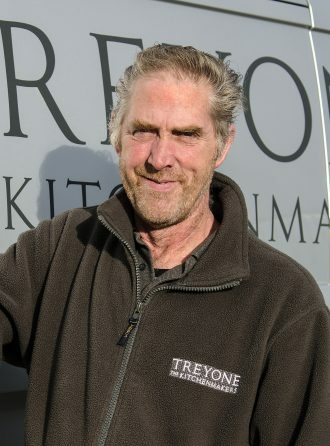 With over two decades’ experience in kitchen design, Douglas works alongside Sarah, who also happens to be his eldest daughter, in the Truro showroom. His career has included spells at Harvey Jones and Neptune, a clutch of customer service awards and many of his designs (to-date over 500 completed kitchen projects) being featured in magazines over the years. His professional background lies in architectural design for the engineering and construction industries. As well as fuelling his passion for pursuing design/build and renovation projects in his spare time, this makes him well-placed to share first-hand experience with clients embarking on remodeling projects. Paul is the technical brain behind Treyone’s kitchen making operation. He ensures all projects run on time and to budget, transforming the designers’ visions into glorious reality. He takes design briefs and new orders from the designers each week and then specifies all materials and creates cutting lists and CNC codes for the workshops, over a two week period. The efficient systems he has in place mean that each kitchen project benefits from being completed in a timely manner with great care and attention to detail. Originally from Derbyshire, Erin’s journey south west to Treyone has been via a degree in Web Design, admin/management with the Royal Mail and her own woodcraft business, Little Shed. Her role at Treyone, encompassing social media marketing, IT troubleshooting, purchasing and admin, allows her to make full use of, and develop, her many skills and interests. As Treyone’s in-house accountant, AAT qualified Donna is an indispensable member of the admin team. Her highly organised and methodical approach, coupled with her wide-reaching experience of working across a variety of sectors, including manufacturing, ensures the smooth running of all operational matters. Originally from the Midlands, Donna has enjoyed living in the South West for some 20 years. 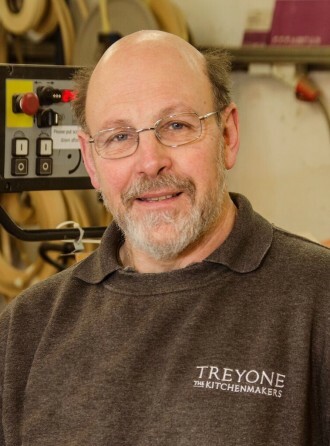 Pete is our senior cabinet maker with an enormous breadth of experience gained in his 22 years with Treyone preceded by 25 years as a Shipwright in the Royal Navy. 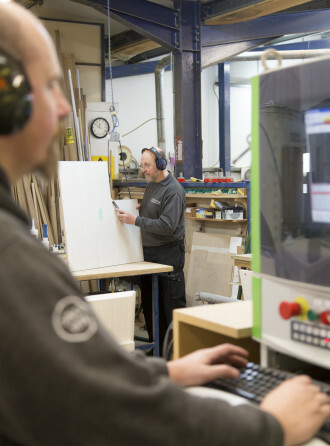 Pete is often tasked with making the more intricate items of cabinetry. Ian is our senior wood machinist. 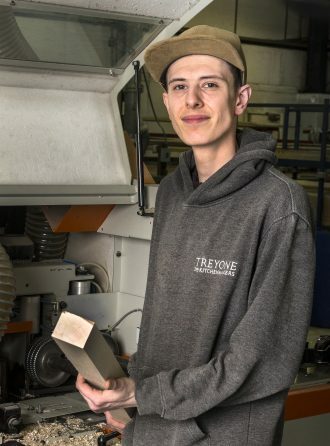 He initially joined Treyone as an apprentice on his 16th birthday in 1982. 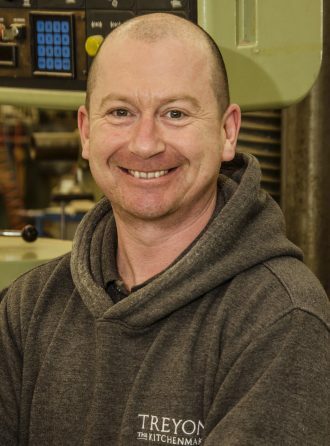 He left the company over a decade later, spent 12 years in the building trade and returned to us in 2010 to run our machine workshop. Jeff joined Treyone in 1997 as our delivery man. With a background in engineering, Jeff is an indispensable member of our team, working not only in deliveries but as a highly-competent, multi-skilled extra pair of hands on installations. He is also our in-house maintenance man. With a long-standing career in the building trade, Neil started with Treyone in April 2017. He ensures all Treyone deliveries get to customers on time and in an orderly, friendly manner as well as helping out in the workshop. Steve came to Treyone in 2000 and was trained as a spray painter. 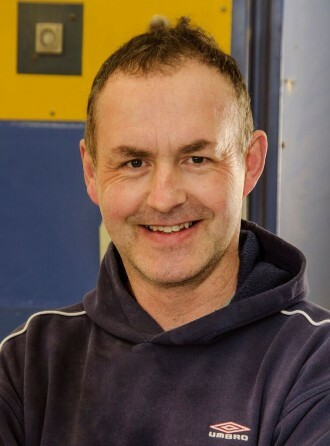 With a wealth of experience in all the technicalities of paint and clear lacquer finishes, he’s now in charge of our paint booth and undertakes most of the preparation and finishing of our cabinets, doors, mouldings and shelving. Starting at Treyone in 2005, Simon joined us as a relatively inexperienced newcomer to the industry. 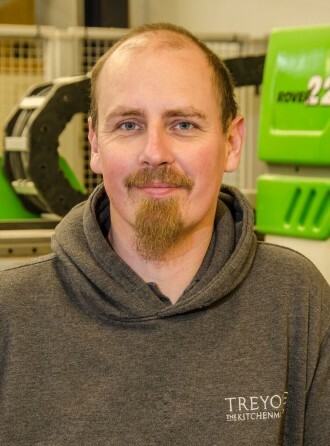 Keen to learn the various trades, Simon is now a versatile all-rounder who, having worked for several years with sheet materials in our cabinet making workshop, has now made his mark in timber machining and assembly. Richard makes up one of three father/son combos at Treyone. He came to the company in 2014 with practical and technical skills, quickly proving himself invaluable within the cabinet making team. Steve joined Treyone in 2015. An experienced kitchen maker with all-round knowledge of the processes of turning sheet materials and hardwoods into kitchen cupboards, he is also our relief sprayer. Matt is another member of our fabled father/son combos at Treyone. He is gaining experience working across both workshops and in installations, and proving himself to be a fast and willing learner. Joining the Treyone team in summer 2017, Aran is tasked with taking on the many and varied general roles in the wood workshop, from machining to finishing. 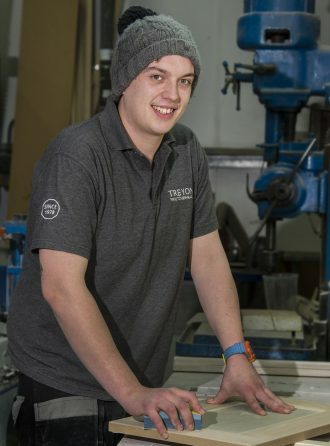 He holds a Level 2 Diploma in Carpentry and a Level 2 B-Tech in Construction and although his career to-date has seen him complete stints as an apprentice with Driveline GB and working at Argos as a team leader, he feels very much at home at Treyone, doing something he loves. 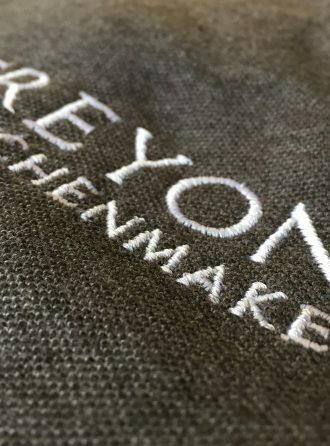 Many of our kitchen installers have been with us for a long time; in fact four of our team share almost 100 years of service between them – Pete Hunkin, Robin Pingree and Gary Watson have all worked for Treyone for over 25 years, while Paul Ferguson has been with us for 15 years. The team also numbers more recent members – Steve, Darren, Simon and Rob – all of whom are also garnering praise from our clients. We recognise that the installation process and indeed, the installer, are integral to the success and happy experience of a kitchen project. All our installers are highly skilled and capable of handling the wide variety of situations that can crop up in an installation. As well as being excellent carpenters they are all well versed in installing kitchen appliances, stone and other solid surface worktops, tiles, glass, sinks and taps. Just as important as their multitudinous technical skills, are the personalities of our installers – all the members of our team are pleasant and considerate characters who understand the stresses and strains on clients of having people working in their home.